Dunluce Castle, along the Antrim Coast in Northern Ireland has a rich history. Throughout all of Ireland, and Northern Ireland there are a plethora of ruins that inspire the imagination and have a rich history and lore. Some, like Blarney Castle are well known, and have had a myriad of visitors over the years. Other spots like Corcomroe Abbey, the Mulgrave Barracks, and even Mahon's Rock appear to have slipped out of time and seem to be waiting to be discovered again by visitors who stop by for a visit. 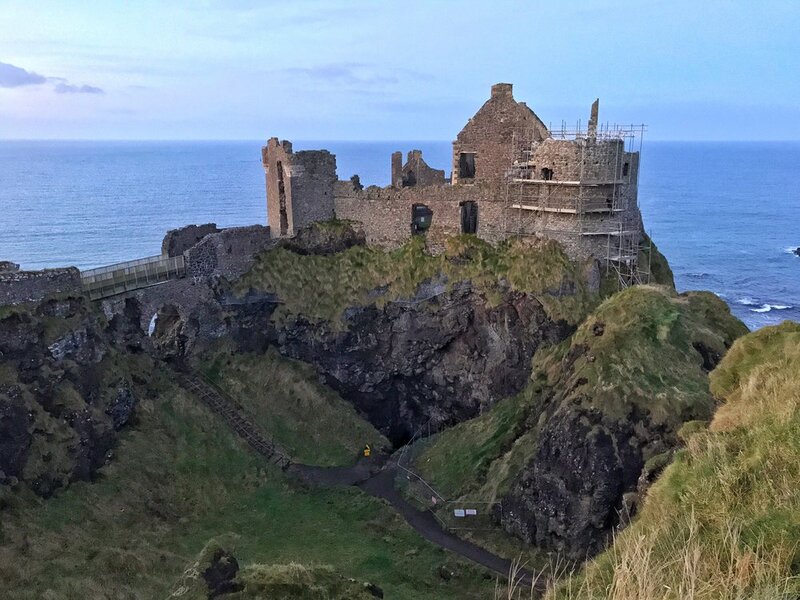 One of the more accessible spots with a rich medieval and modern history is Dunluce Castle, whose ruins rest a hundred feet above the ocean along the coast of Northern Ireland. The castle sits 100 feet above the ocean, and also rests above a large sea cave. 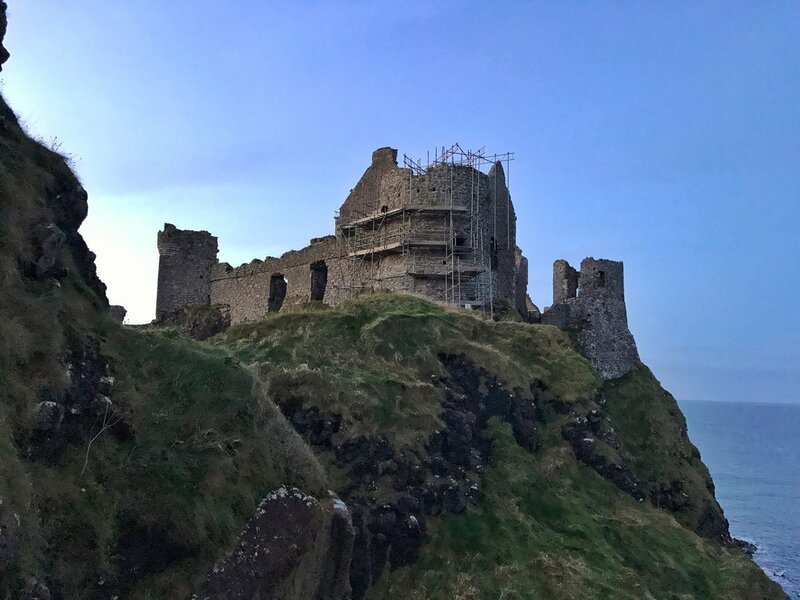 Directions: The castle is located at 87 Dunluce Rd, which is just outside the nearby town of Bushmills, which, if you are a whiskey aficionado is the location where the Bushmills distillery is located. 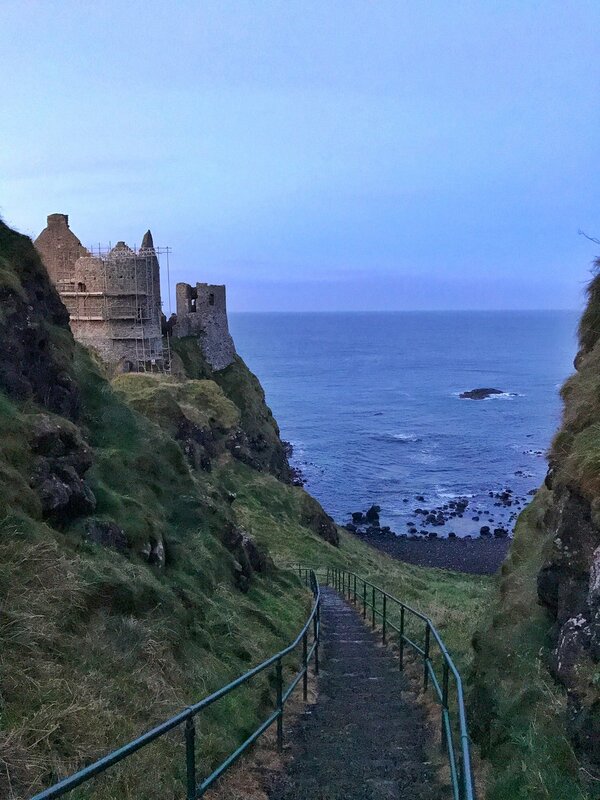 From Bushmills, travelers will want to follow the A2 two and a half miles to the northwest, where the castle is readily visible along the Antrim Coast. From Belfast, it is an hour and a half drive to the North, and from Dublin, it is a three and a half hour drive. While there are a number of day – and multi-day tours that include the castle as part of their route, tourists that are driving should strongly consider having a portable GPS unit as part of their rental package to aid in route and location finding, along with their passports as Northern Ireland is a separate country from the Republic of Ireland. Visitors should also be advised that pricing in Northern Ireland is in British Pounds, not Euros. Visitors to the castle can explore the grounds, which include a walk down to the coast, past the cave. Operating Hours/Fees/Visits: The castle is open year-round, and from February through October, is open daily from 10 am through 5pm. During the winter months of December and January, the castle is only open from 10 am through 4pm. As of 2017, it is five pounds for an adult to visit the castle, and three pounds for children 4-16. There are a number of interpretive panels near the walking paths to and from the castle, and a number of trails that lead across the bridge, and into the castle, as well as under the castle, past the Mermaid’s Cavern below the castle. All of the paths into the castle themselves are level and accessible, but the trails down near the cavern require descending - and ascending approximately a hundred steep steps. Like the nearby Giant's Causeway, Dunluce Castle has some great coastal views. Castle History and Legends: Perhaps the most unique thing about Dunluce Castle is that it is on an column of rock that is connected to the cliff by a narrow bridge. In addition to being in an imposing spot, the castle’s position also was of strategic importance to the various parties that controlled the location over the years. While early Irish fortifications were built there, the first recorded “castle” on the spot was built during the thirteenth century by Richard Óg de Burgh before passing to the McQuillan’s, who built substantial additions to the castle in 1513. During this period, the castle also had a town - Dunluce Town - on the mainland side which was burned down in 1642. Much later, the castle became the home of Clan MacDonnell, and played a prominent role in Sorely Boy MacDonnell’s life. As can be seen from my brief description of the castle’s history, there are innumerable stories surrounding the castle, but the most infamous is the rumor that during the castle kitchens fell into the sea during a storm, which unfortunately, has since been disproved. Since the castle did fall into ruin however, it has had a second life in movies (Jackie Chan’s The Medallion) television shows (Game of Thrones), has served as an album cover for Led Zeppelin, and served as the inspiration for C.S. Lewis’ Cair Paravel in the Chronicles of Narnia, among other things. Even today, in ruin, the castle still inspires, along with the scenic views it still commands. Tips: Visitors to the area on a group tour on an individual trip should consider visiting the Carrick-A-Rede Rope Bridge, the Giant’s Causeway, The Dark Hedges, and the castle all during the course of a day in Northern Ireland, as they are all fairly close together.